While our thirst for computing power increases, so does the need to move live data – and even full OS installations – between PCs. 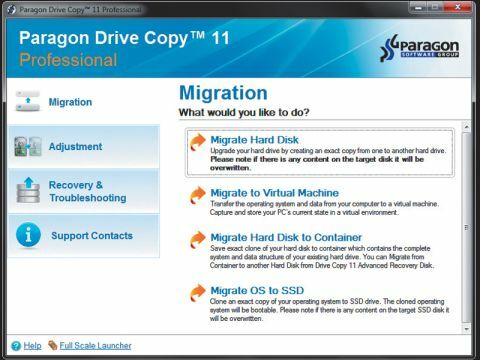 If you have a second external disk drive or solid-state storage device, Paragon Drive Copy 11 Professional can help solve these data migration problems in one. Drive Copy 11's interface is clear and uncluttered, with a launcher for common tasks. These include data migration between computers, modifying disks to take advantage of the new GPT standard without losing data, creating recovery disks, and transferring files to and from archives. GPT support is welcome, overcoming the space restrictions associated with disks containing a traditional master boot record. Tasks like creating partitions and manipulating existing ones are amply catered for, which means you'll never have to drop into Windows to set up a new hard disk before migrating data to it. Select the 'Undelete partition' tool. For more complex tasks, there's the Paragon Scripting Language. This lets you create complex, exacting data migration jobs, which can be scheduled to run at specific times. The software can also copy your Windows OS to a virtual machine. It understands the virtual machines maintained by VMware Workstation/VMware Fusion, Microsoft Virtual PC and Oracle's VirtualBox. This lets you test potentially destructive scenarios in a safe virtual environment. Drive Copy isn't restricted to the FAT 16, 32 and NTFS partitions found in Windows. It also lets you copy and restore Linux Ext2FS, Ext3FS and Ext4FS file systems, and there's even 'limited' read/write access to Apple's HFS+ partitions. The help system is exemplary, with illustrated walkthroughs, and the odd quirk of language (possibly due to the program's German heritage) is easily forgiven.